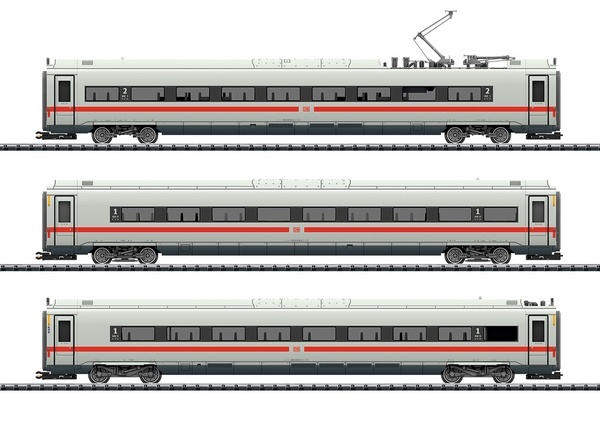 Prototype: Add-on cars for the German Railroad, Inc. (DB AG) ICE 4 high-speed train, class 412/812. One (1) MW 1 intermediate car, class 812, 1st class. One (1) TW 1.2 intermediate car, class 412, 1st class. One (1) MW 2.2-HP intermediate car, class 812, 2nd class. Add-on to the powered railcar train 9005 as ICE 786, for the train route Munich Main Station – Würzburg Main Station – Fulda – Hamburg-Altona. The cars look as they currently do in 2018. Model: This is a three (3) part add-on for the ICE 4 basic train in a length scale of 1:95. It has special close couplings with guide mechanisms. The car set also has factory-installed LED interior lighting. The interior lighting is supplied with power from the continuous electrical connections for the entire train and only works and can only be controlled digitally when the car set is coupled to the basic train. Both pantographs on an intermediate car can be raised and lowered with a decoder as a digital function only when the car is coupled to the basic train. Total length 90,5 cm. The 22971 basic train can be extended with the 23971 add-on set and the individual 23972 intermediate car. This add-on car set for the ICE 4 can be found in an AC version in the Märklin H0 assortment under item number 43724.